The 30-year-old Wilson had set a midnight deadline for a new deal with Seattle. He wanted certainty about his contract before the start of the team’s offseason workout program, which began on Monday. Wilson showed up for the first day and by the end of the night was posting a video with wife Ciara announcing the agreement. The deal ends the debate about Wilson’s future with the Seahawks, although there seemed to be little doubt he would remain in Seattle for a while. The team held leverage knowing it likely had at least three more seasons with Wilson under center. Even if he played out 2019 under his current deal, Seattle could have used the franchise tag if needed to keep him under contract through 2020 and 2021 at a reasonable price by quarterback standards. But the extension allows Seattle to budget for the future knowing how to work with Wilson’s hefty paycheck in the years ahead and build a contender around the former third-round pick that has developed into a franchise QB. Wilson’s new deal was going to have to top the extension signed by Rodgers before the start of last season. 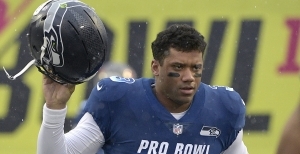 Wilson was the second-highest paid player in football behind Rodgers when his deal was signed in 2015, but had fallen to the 12th highest-paid QB in the league, according to Overthecap.com. The five-time Pro Bowl selection is coming off arguably his best season as Seattle went a surprising 10-6 and earned an NFC wild card before losing to Dallas in the opening round of the playoffs. It was supposed to be a rebuilding year, but the Seahawks were ahead of schedule thanks to their return to a run-first offense and Wilson’s exceptional performance when tasked to throw. The 5-foot-11 Wilson threw for a career-high 35 touchdowns and matched his career low with seven interceptions. He attempted only 427 passes — his lowest total since his second season when Seattle won the Super Bowl — but his efficiency was a career best with a 110.9 passer rating. He also ran only 67 times, a career low, as the improved run game and offensive line play allowed Wilson to stay in the pocket more and scramble for his life less. It was a stark change from the 2017 season when Seattle missed the playoffs for the first time under Wilson. He led the league in touchdown passes, but also was Seattle’s leading rusher due to a non-existent run game. The idea of Wilson ever leaving Seattle has always seemed a stretch. Teams simply don’t give up on quarterbacks with the kind of success he’s had. Wilson has led the Seahawks to the playoffs in six of his seven seasons, the only miss coming in 2017 when Seattle finished 9-7. He won a Super Bowl in his second season and got back to the championship game a year later before making the one major mistake of his career that will linger until he wins another title, throwing a goal line interception in the final minute when the Seahawks had a chance to take the lead on New England. Wilson has shelved the stigma of short quarterbacks being unable to play in the NFL. He’s also been extremely durable, never missing a game while playing through significant knee, ankle and shoulder injuries. More AP NFL: HERE and TWITTER.